Leo ~ "Neroli, bergamot, and mandarin tame Leo’s boundless need for power, while hydro-distilled lemon inspires focus. Jasmine Sambac balances Leo’s ringleader tendencies, encouraging trust and dissolving fear of the unknown. Ambrette seed anchors this fiery sign, granting tranquility and gratification." Additional notes include lemon. Sagittarius ~ "Neroli and lime calibrate Sagittarius’s innate optimism and fiery ambition, while warming cypress ensures protection. Sandalwood and honey ground the exuberant Sagittarius disposition, inspiring this notoriously nomadic sign with a sense of home, loyalty, and appreciation." Additional notes include pinon. 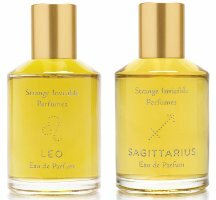 Strange Invisible Perfumes Leo and Sagittarius are available in 50 ml Eau de Parfum, $275. My star sign AND my rising sign! Cool! Yikes! Is the SI line worth that price? I really like some of them. They’re natural, which generally costs more, plus they’re distilling many of their own materials (again, costly on such a small scale). So it depends on what you see as “worth” paying for. I am attracted to the Sagittarius (and married to one in real life). Is that a sign or what? Yes. I think you have to buy it. I like the idea too…but either I’ve missed some (none of them seem to be on her website) or she’s moving much more slowly than the original plan. Haven’t seen my sign (Scorpio) yet. I’m a Cancer. Do you think any perfume house will actually release a perfume called Cancer? Maybe they can call it CRABS? You can try Soular Therapy, they make perfumes, soaps, candles, all in each of the twelve signs. CnR Create also makes perfume for each sign; so far I can only find CnR info on Fragrantica. Soular Therapy has their own website. Enjoy! In my hippie days, we called the sign Cancer, Moonchild. Maybe they’ll go with that. It’s funny that the earlier releases enhance the sign-conferred qualities of their wearer, while Leo “tames” the wearer’s boundless need for power, “balances Leo’s ringleader tendencies” and “anchors” the fire of this sign. Sounds like someone doesn’t like Leos!